City tours are a great way to get to know the history and culture of a new destination. During our time in Toronto, we were able get a pretty good overview of the city thanks to our tour with Toronto Bicycle Tours. Ok, so here’s a little secret. I don’t know how to ride a bike. There. I said it. I usually keep this on a strictly need to know basis. But. I figure I might as well come clean. I’ve tried to learn, really I have!! But I just can’t seem to get it. The last time I tried I ended up in a Costa Rican ditch. No lie. 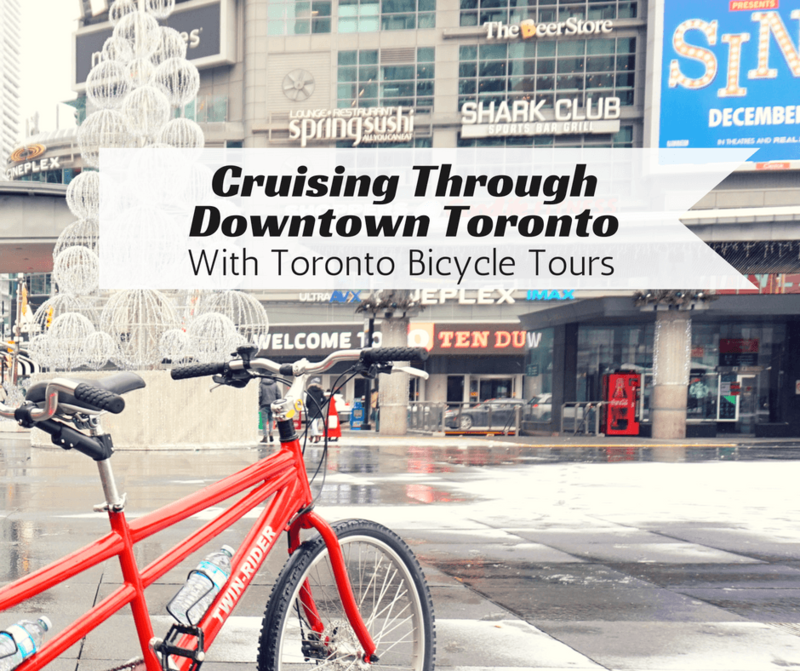 So when Toronto Bicycle Tours invited us on their Heart of Downtown Tour, I hesitated. I hesitated big time. I politely declined Terrence’s offer. The next morning I received another email from Terrence, “We have a tandem bicycle – the back seat is all yours!” And just like that, we were setting a time and date. I was nervous, but also pretty excited. Together with Lindsay of I’ve Been Bit, we met Terrence at the designated meet up location. Right away, his smile and cheerful personality let us know we were about to have a fun tour. After some quick introductions, we headed over to get the bikes and helmets, and to get our safety instructions. We went around the parking lot a few times to practice. I was so glad that Toronto Bicycle Tours could provide tandem bikes to it’s customers and that Terrence was such a great instructor. The fact that I couldn’t ride a bicycle was never an issue and after a few loops around the parking lot I felt like a pro. And then the next thing I knew, we were off! The first thing Terrence asked us to do once we got outside was to get our bearings. Lindsay was right. I was wrong. We continued on and over the next few hours learned about Toronto’s history, architecture, neighborhoods, and famous landmarks. And even though it was a little chilly, we were having so much fun we barely noticed. Terrence was a wealth of information and answered all of our questions. He was constantly checking to make sure we were ok, and provided us with snacks and water about half way through the tour (always a perk!). Something else that I really loved was that he seemed to love taking pictures as much as we did. He had no problem pulling over so we could take pictures of things and he was constantly taking out his camera as well. As a blogger, that was much appreciated. We’ll never forget our first bike tour and how much we enjoyed ourselves with Toronto Bicycle Tours. They made the whole experience so much fun and helped us to fall even more in love with Toronto. We can’t wait until our next visit so we can go cruising with them again! You hit some great spots, and in the snow! I would have been apprehensive at first but this looks fun! Oh my gosh, I live in Toronto and I didn’t even know about these tours. It looks super fun and like you saw some great places. I’ll have to check them out and perhaps take a local city tour of my own! I think touring your own city is a great idea! A lot of times we don’t realize how many cool things are right in front of us. And in winter! You are brave. Wish I knew how to bike! Oh that would be good for me and my husband then! I wonder how hard it is to bike in snow??? I really enjoyed the street art! Keep up the great work. It must have been fun! Loving your honesty! Haha! Such a cool experience – especially during the winter! I wouldn’t have thought of this! I’m impressed! You biked and you biked in the snow – well done! We’ve done bike tours though Toronto Bicycle Tours and they are the best! Glad that you enjoyed yourself. What a lovely way to see the city. The pictures are amazing! It’s a nice touch that water and snacks were provided. It’s the little extras that make a company great. Oh this is just so cool, I mean touring around Toronto in a different touch! Truly a unique way to experience the city! i always look for new way of exploring the places and glad that i came across your blog. last time i did cruise tour and i loved it. Bicycle tour is some that i haven’t done yet. i never been to Toronto and this tour looks perfect for my next adventure trips. I’ll be doing one of the Toronto Bicycle Tours next month, and now that I’ve read your post, I’m so excited about it!